In a previous post titled On beautiful memories and change, I mentioned a childhood memory about waking up every morning to my mum praying by my bedside. That used to be how i start my morning and anytime I am too tired to kneel by her side, I mutter my ‘Amen’ half asleep and still in bed. I got to know the importance of praying from a very early age, so it has now become part of me. Even though I do not always kneel by my bedside, I make sure to say a word of prayer at random times in the day and this has really helped me. Prayer is meant for everyone. We have different religions and means of communicating with our creator so Praying is definitely a very familiar word. As familiar as it though, do we take it seriously? We start each day with plans of what we need to do, where we need to go, we schedule business meetings, we think about how to ‘beat’ time in order to achieve our daily goals but in there, do we a schedule a private time with our creator? I am Christian and I know how important it is to have a functioning prayer life. It gives your life a kind of meaning that surpasses human understanding. Amongst other ways, Prayer is one means of communicating with God. I like to think of prayer as a means of telling God my innermost desire. Sometimes, I even imagine I can see him and have a proper conversation…..and he listens…. I say he listens because lines begins to fall in pleasant places for me. Connecting with God daily is like saying ‘Good morning’ to your parents every day. They are happy to hear from you and willing to help in anyway they can (whether you ask or not). That is exactly how our relationship with God is. 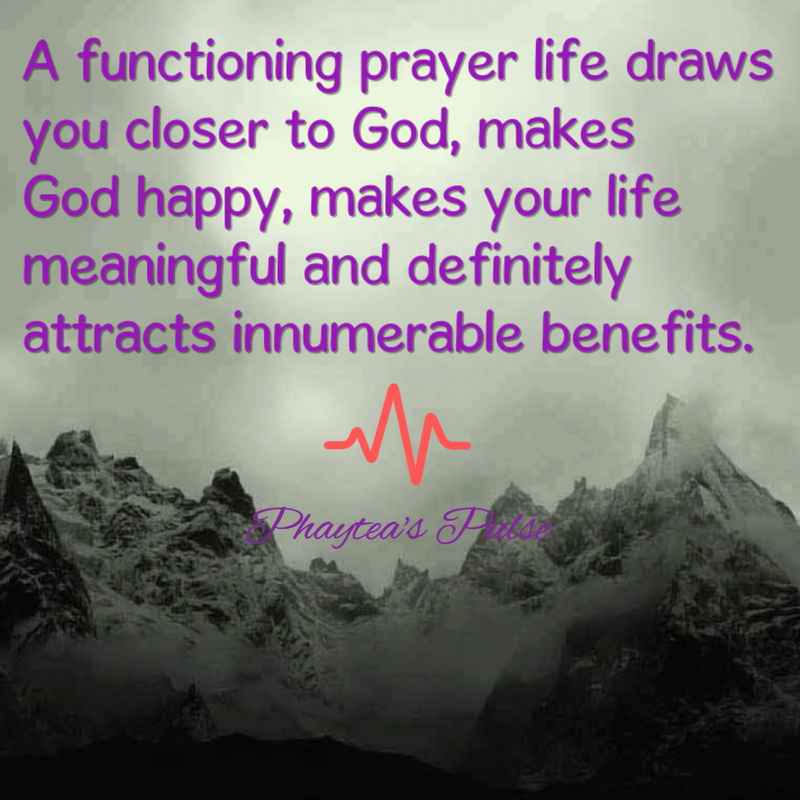 A functioning prayer life draws you closer to God, makes God happy, makes your life meaningful and definitely attracts innumerable benefits. Have you noticed that when you have a private time for your creator, you find it really easy to live a life filled with gratitude? This is so because you know there is someone watching over you, you know he will respond to your prayers when the time is right….That is what prayer does…you just believe strongly. Developing a relationship with your creator through prayer makes your life meaningful even when things are not so good. You have peace of mind. Praying allows you keep your excesses in check. You avoid unnecessary temper tantrums and bad attitude. Praying gives you a clear direction and gift of discernment. Prayer makes you forgive easily and you can be forgiven too. Prayer takes away fear, worry and comforts in when you are sad. The confidence you get from praying cannot be understood. It is almost like taking your parents to the kid that keeps bullying you in school. You just know that everything will be fine. Have faith and believe strongly in your prayer and God’s word. Abide fully by God’s word. Learn to be patient because delay does not mean denial. Put in some effort. Work while you wait. (Faith without work is dead). Determine to always start your day with prayer. Fill yourself with content that align you with God. Read the bible, quotes and inspirational books, listen to gospel public speakers or songs that inspire you. I personally like quotes by John C. Maxwell because I always get that instant nugde to keep pushing. To live a meaningful life, one does not have the sole power to achieve success, we need to prioritise our private time with God and ask for direction. Has prayer helped you in anyway? I’ll love to read from you. Great post on prayer – I’m a big believer in daily prayer – it’s what God wants from his people and it reminds me that He is in control of my life and watching over me and my family too. If I give it to God then I know it’s in safe hands. I recently put out a post on prayer and it’s benefits too, so it is nice to see an echo here. Thanks for this great post. Yes, without prayer I wouldn’t be who I am, in fact I probably wouldn’t be alive as I’m a nearly 20-year cancer survivor. On the importance of a prayer life and the impact it has on others around you. You’re welcome. Enjoy your day. I often silently whisper to the universe looking for a blessing. I find it comforting and that it connects me with everything. I don’t pray. I’ve never prayed & I haven’t had any interest doing so. I was brought up as an atheist, even though we do are part of the church. But well, that’s basically for a free graveyard spot. I think it’s cool that some people pray, I mean – whatever helps them to go through things in their heads. For some it’s praying & others it can be sports or something else. Nice post! I love praying and it has helped me all through my life. There can be no doubt that prayer brings peace. Yes, it does. We should all thank more while praying and ask for less. I agree with you Sabine..gratitude gives room for more blessings.. I do try to pray, but don’t do it nearly as often as I should. I always loved the quote that says that prayer doesn’t change God. Prayer changes us. And it does as it moves us into a better frame of mind with our creator. And it does help us to be more thankful. Totally true..Same thoughts as well Arv! I don’t pray. I am agnostic and I think that the existence of God is unknowable. Still it’s nice that some people find comfort in their faith, I respect other religions. Nice article .Prayer makes us more connected to the Divine ! !